El Niño and La Niña are the names of climate events occurring in the tropical Pacific Ocean, which are now globally infamous. They characterise a close relationship between the ocean and the atmosphere, in which the main protagonists can have devastating consequences worldwide. 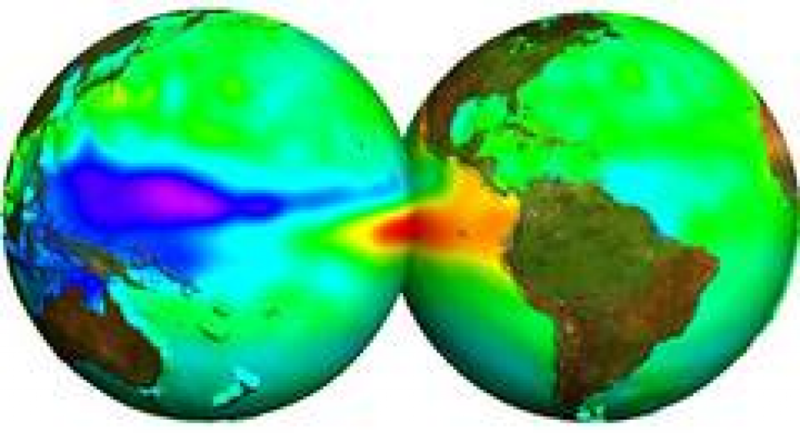 Satellite altimetry, which measures sea surface height (which rises with higher temperatures during El Niño or falls with colder temperatures during La Niña), is vital for the early detection, analysis and close monitoring of these phenomena. Topex/Poseidon was one of the first witnesses of the 1997-98 episode, which occurred with exceptional amplitude. Today, satellites and in situ observations have increased the available data and thus allow the numerical models to be refined. Three moderate El Niño episodes occurred in 2002, 2004 and 2006 but due to the complexity of ocean-atmosphere interactions, their intensity was not correctly forecasted. To tackle the fact that no real periodicity can yet be determined, and to determine the extent to which global warming affects this recurring phenomenon, Jason-2 will help by ensuring continuity of observations, and improving data quality.